I suffer from Plantar Fasciitis, an inflammation of tendons in the arch and heel of the foot. It’s a reoccurring pain in the heel that can travel up the calf of your leg making walking any distance downright torture. The best way I’ve found to control this type of foot pain is to wear shoes that give very good support to both the arches and ankles. Z-Coil shoes claim to be shock absorbers for the body, reducing the impact created when the weight of your whole body comes down on a very small structure: the heel of your foot. Another problem I have with standard shoes is I wear off the heel on the outside edge. This may be due to arthritis or other changes over the years, because it has become more noticeable the older I get. Z-Coil shoes not only are professionally adjusted to your specific foot and walking pattern, they also have replaceable heel pads. For a modest cost, your local Z-Coil dealer can replace your worn heel pad and readjust its positioning when you walk in order to maintain that relief from pain that you noticed the very first time you walked in your Z-Coil shoes. Unfortunately, this means you can’t go to your local discount store and hope to find a rack of Z-Coil styles to choose from. This is specialized footwear that is only available at Z-coil online store. You could find yourself traveling a few hundred miles to find the nearest location. But it’s worth it! Public acceptance of these shoes is varied. They definitely don’t look like most shoes that you’ve seen (or worn) before! Speaking as one who must contend with foot pain for months at a time, the cost of about $200 combined with the superhero look of the coil spring isn’t quite enough to completely remove the Z-Coil shoes as an option for me. Others would disagree. 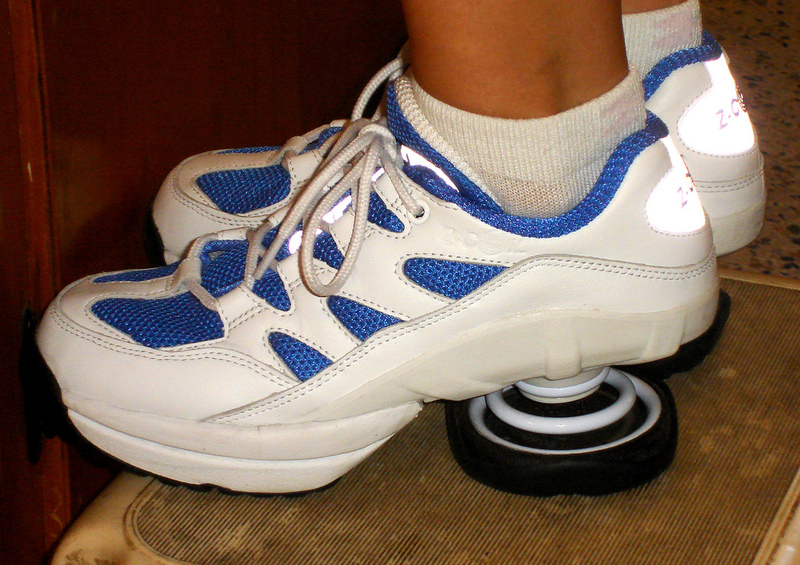 Some think Z-Coil shoes look like a 6th grade science fair project! 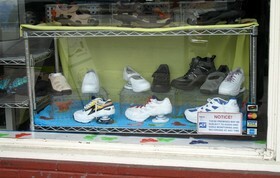 Of course there are other options when it comes to shoes designed to alleviate foot pain. For considerably less money (about half) and with a more traditional style, Gravity Defyer shoes offer the same benefits as the Z-Coil shoes. Being able to walk down the street without people gawking at your feet does have some merit. Here’s a comparison of Z-Coil shoes vs Gravity Defyer shoes. Another option is the Masai Barefoot Trainer (aka “the anti-shoe”). The claims are that the MBT improves posture — which in itself may reduce back, hip, leg and foot pain. However, this footwear admits to being unstable. The whole point of the MBT shoe is the curved sole, which activates numerous muscles strengthening the body. It’s an interesting approach, though one that should be examined cautiously. Of the 3 examples listed here, the Z-Coil name has the largest presence on the Internet. Overall comments about customer satisfaction appear to be overwhelmingly positive. Good Housekeeping apparently thinks otherwise. Although rebuttals to that negative magazine article are also quite prevalent. My one word of caution would be the fact that the wide-based heel with a narrow support could catch on things creating a tripping situation. When it comes to foot pain relief, some people tend to take a desperation approach and buy the first thing that sounds good. Instead, it’s important to explore a variety of options whenever possible. Making the best choice depends on a number of factors. No one product is the perfect answer for every situation and every person. Shop carefully and listen to the advice of your podiatrist before making your own decision as to the best way to address your foot pain.